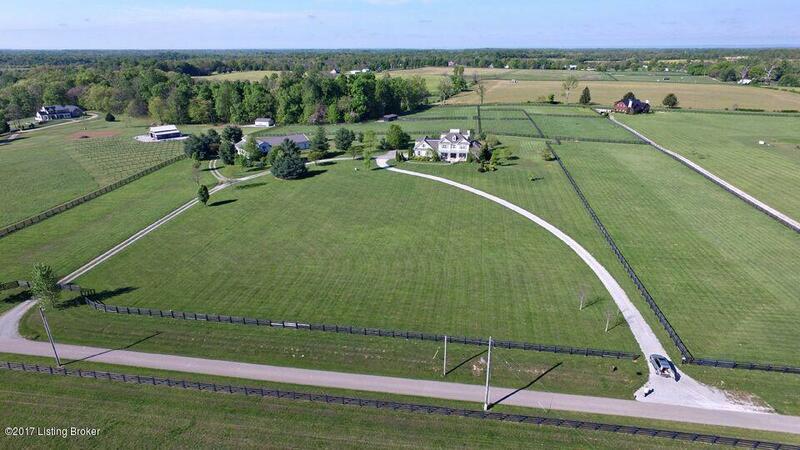 15 Acre Horse Farm in Horse Country and North Oldham School District. Privacy surrounds this builder's personal home. This custom Hardie board home features nearly 5,000 sqft of finished living space, almost complete separate apartment, 2,200 sqft of horse barn with rubber matted large stalls 4 to 6, cooled tack room, full hayloft, RV parking, roughed in half bath and 2100 sqft of heated garage/workshop. Whole house generator (propane), 6 paddocks, heated water system to paddocks, 2 gated entrances, 3 parcels make up this 15 acres so can be divided (see plat). Home features new roof (May 2017), new windows. 5 bedrooms, 4.5 baths, hardwood floors, custom moldings, views of galloping horses, 1st floor master suite, 3rd floor features attic space, cable/internet has been ran and installedPropane is for the cooktop and fireplace. The home is heated with 2 separate heat pumps. Home does have broadband. The walkout lower level offers billiard area, full bath, family room, and wet bar and plenty (852 sq. ft.) of unfinished storage. Listing provided courtesy of Exp Realty Llc. © 2019 Metro Search, Inc. All rights reserved.